Lime or Lemon? : Plastic Around Carrots: Are You Buying Carrots or Plastic? 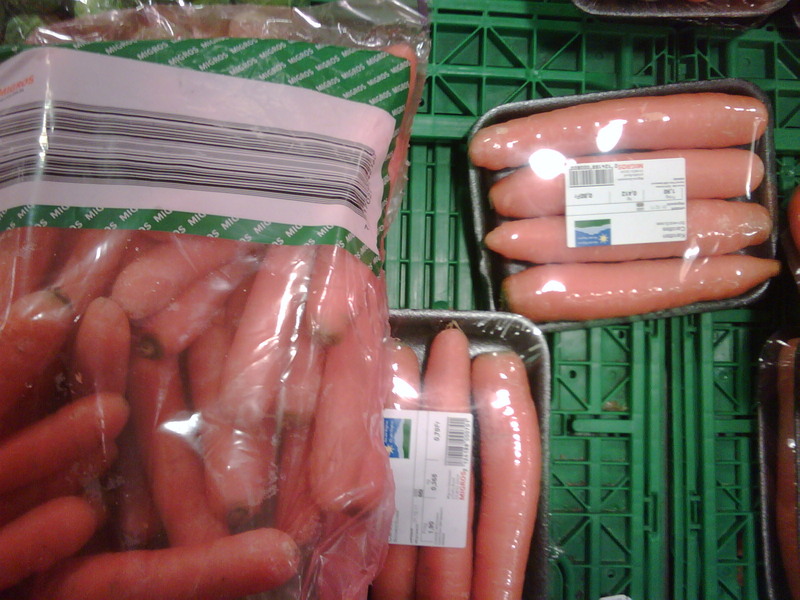 Plastic Around Carrots: Are You Buying Carrots or Plastic? Carrots are wonderful vegetables. I use a lot of carrots in soups or as vegetable side dishes. Since I don’t have a garden I get my carrots from the farmers or supermarket. I like to select carrots and buy the ones I like. Depending on the dish I may choose narrower or thicker ones. The narrower I find sweeter and crunchier for eating raw, the thicker ones are easier to grate or more convenient to chop for soups or good in stews. In the supermarket the only option is to use the plastic bag offered. In order to reduce the amount of bags and consequently the costly garbage at home I use one bag for all the vegetables and fruits I buy instead of a separate bag for each. And I often reuse the bag at home for something else. So yesterday in a supermarket I chose my carrots and wondered around the vegetable section for a while. I found there were 4 different possibilities to buy fresh carrots. Select your own and weigh them yourself. Price per kg 1.60. 1 kg packaged in a plastic bag. Price per kg 1.60. A value line 2.5 kg packaged in a plastic bag. Price per kg 0.84. 4 carrots packed on a plastic tray wrapped in plastic. Price per kg 1.90. Voilà! Number 4 was not explicitly marked as a bio-organic product that would perhaps justify a higher price. Apparently there is demand for carrots packed on a plastic tray and people are willing to pay more for it. In fact, I would just be paying more, once for the tray and second time for creating more garbage. Every bag of garbage you generate costs in Switzerland.Personally, I find no use for that tray at home to give it “a second life” in some other use to justify its existence even if the price was the same as for the loose carrots. Yes, I have considered the point of hygiene as well before writing this, but did not find a convincing point. I see people eating fruit and vegetable bought in supermarket without washing them first. So they are not really bothered about this at all. When I buy the carrots selecting them from a crate myself, yes, someone else may have touched them, but I will wash and typically peel the carrots at home, so no issue there. Please help reduce meaningless plastic!